Where do I use my Craft Stash voucher code? Craftstash is the ultimate craft store that stocks all the craft products you could ever need including card blanks and envelopes, cardstock, colouring media, glues and adhesives, card and paper, paper stacks, pens and pencils, storage options, card kits, craft tools, die cutting machines, hot foiling products, die cutting dies, embossing folders, stamps, inks pads, masks and stencils, re-inkers, embellishments, planners and binders, stickers, magazines and much, much more. All of these products are available from hundreds of top arts and craft brands including brands exclusive to Craftstash and top crafting brands like Anna Griffin, American Crafts and Carabelle Studio. As well as all this Craftstash also boast an impressive bargains section where you’ll find clearance items, bundles and special deals on a selection of big branded products. You can also discover tons of inspiration in the form of guides and step by step videos as well as new in products, craft celebrities and a selection of Craftstash reviews from previous customers. Craftstash has a dedicated Christmas section where you can find tons of papercraft products for the festive season. Discover card stock and card blanks, decoupage and toppers, Christmas dies, gift wrap, glitter, sequins, hot foiling, Christmas kits, stamps, embossing folders, stamp and die sets, embellishments, masks and stencils, magazines, mixed media, paper pads and wooden elements, all suitable for the festive period with Christmas themes and features. If you’re interested in die cutting you can find a huge supply of die cutting products at Craftstash. Discover multiple die cutting machines, machine accessories, die cutting dies, Crafter’s Companion die cutting machines, Cricut machines, silhouette machines, ultimate crafts die cutting machines, Sizzix die cutting machines and Spellbinders die cutting machines. As well as all this you can also find an array of hot foiling products such as hot foiling machines and accessories as well as hot foiling stamps and embossing folders. Add intricate style to your projects quickly and easily with all these die cutting products and add that professional touch to cards and off the page makes with every embossing and hot foil tool you purchase too. Whether you’re a crafting professional or an arts and crafts novice who enjoys the odd project from time to time, it’s crucial you have the basic crafting essentials in your locker before you begin any new piece. However, Craftstash knows that stocking up on the essentials, and then keeping stocked up, can be quite expensive, which is why they offer an array of affordable products on their website. These craft products include card blanks and envelopes, cardstock, colouring books, gliding glazes and pearls, glitter glue, paint, texture pastes, double sided tape, foam pads, glue guns, pads and ink pens, PVA glue, spray adhesives, stencil tape and masking products, varnish and decoupage glues, colouring pencils, alcohol markers, crayons, watercolour pencils, fineliners, glitter pens, blending tools and ink, cutting mats, hold punches, measuring tools and much more. Craftstash wants you to be completely satisfied with your purchase so they offer a full refund for any products that are returned within 30 days from the date you receive your order, so long as items are unused, fully resalable and in their original packaging. 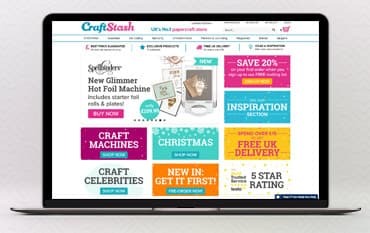 CraftStash is the leading UK online papercraft store that sells a plethora of stationary and papercraft products including dies, die cutting machines, stamps, ink, basic essentials, embellishments, planners and journals, magazines and much more. All these products come from top brands such as Apple Blossom, Craft UK, Simple Creative and Paper Addicts, with many being available exclusively to Craft Stash. Shop online for your paper craft and stationery items with a CraftStash discount code and save money on your order, you can also enjoy free delivery and the best price guarantee on all products.